With the Alberta election continuing to shock and amaze, I'm a little late getting to the federal averages for last month. It was a busy month, with 10 national and four regional polls being conducted, interviewing a grand total of almost 33,000 Canadians. And the numbers put the Conservatives in first place for the first time since Justin Trudeau became Liberal leader. The Conservatives averaged 32.3% support last month, a drop of 0.4 points since February. That nevertheless put them in first place, as the Liberals dropped 2.1 points to 31.5%, their worst score since December 2013 (or September 2013, if we're looking for a month with more robust polling). The New Democrats were up one point to 21.2%, while the Greens were up 1.6 points to 7.9% support. The Bloc Québécois was up 0.2 points to 4.8%, and 2.4% said they would vote for another party. Though the Conservatives came out narrowly ahead in the aggregate, of the 10 national polls in March they actually only led in half of them. But their range in those 10 polls, at 30% to 35%, was tighter than the range of the Liberals: 28% to 36%. In February, the Conservatives ranged between 31% and 35%, so there hasn't been much change. The Liberals, however, ranged between 32% and 39% last month. The New Democrats scored between 19% and 23% in March, compared to a range of between 17% and 23% in February. They've pulled their knees up a little. The Conservatives led in British Columbia with 30.2%, a drop of 0.2 points since February. The Liberals were down five points (the biggest shift anywhere in March) to 28.6%, their worst since September. The NDP was up 3.6 points to 25.6%, not coincidentally their best since September. The Greens were up 1.8 points to 13%, their best in 10 months. In Alberta, the Conservatives were down 3.6 points to 49%, their worst since May 2014. The Liberals were down slightly by 0.3 points to 24.1%, while the NDP was up 2.6 points to 17.2%. That is their best since last spring. The Greens were up one point to 6.6%. The Conservatives were up 0.3 points to 41.2% in the Prairies, and have actually averaged around 41% for the last three months. The Liberals were down 1.7 points to 29.3%, and the NDP was up 0.6 points to 19.2%. The Greens increased by 1.5 points to 8.3%. The Liberals and Conservatives were virtually tied in Ontario, as the Tories were down 0.5 points to 36.2% and the Liberals were down 1.3 points to 36.1% (their worst since September 2013). The NDP was up one point to 18.4%, while the Greens were up 1.3 points to 7.4%. In Quebec, the Liberals fell 2.4 points to 26.6%, their lowest mark in two years. The NDP was also down, slipping 1.1 points to 26%, its worst score since November 2013. The Conservatives were up 1.4 points to 20.8%, and the Bloc Québécois was up 0.5 points to 19.4%. The Bloc has been around 19% for three consecutive months. The Greens were up 1.1 points to 5.5%. And in Atlantic Canada, the Liberals dropped 1.7 points to 48.9%, followed by the Conservatives at 24.4% (+2.5), the NDP at 17.7% (-2.2), and the Greens at 7.2% (+1.3). With these levels of support, the Conservatives would win about 144 seats, up one from February. The Liberals would take 117, down 10 from last month, while the NDP would be up seven seats to 70. The Bloc would win five seats and the Greens two. The Liberals suffered losses in British Columbia, Quebec, and Atlantic Canada, while the NDP was up primarily in B.C. and Ontario. The Conservatives made gains in Atlantic Canada and Quebec. It really wasn't a very good month for the Liberals. They were down in every single region of the country. That compares badly to the NDP, which was up everywhere west of Quebec, and the Conservatives, who decreased in three of the six regions and were up in the three others. The polls so far in April show that things have yet to improve for the Liberals, and the Duffy trial has yet to land a truly damaging blow on the government. But with the New Democrats taking advantage of the softening Liberal numbers instead of the Conservatives, Stephen Harper is not getting any closer to a majority government. Éric, Don:t post, but you have "The Liberals would take 117, down 10 from last month, while the NDP would be up seven seats to 70%." Rather than 70%, just 70, I believe. heh heh, or do post. And 117 + 70 seats is still bigger and the CPC no longer has a majority. Now to wait for the farcical Budget !! Minority governments don't require coalitions. Or were the Conservatives in a coalition with the Bloc and NDP from 2006-2011? Trudeau has ruled out a coalition with the Socialists Peter so you better start adding 144 + 117 with Trudeau relegated to Minister of Amateur Sport! Just kidding, the Conservatives are well on their way to another majority government-Trudeau won't even be Liberal leader after November he'll have to resign after finishing in third place! I still think a Bloc-CPC coalition would be a great idea. Decentralization galore! Inflation is good for the economy. Considering food prices have been stagnant for a number of years, a slight rise is probably good especially for farmers. (do Liberals dislike farmers?). Trudeau can "rule out" all he wants, he will not be the leader of the Liberal Party of Canada the day after the election, if that party does not finish in first place or a close second. And let's be careful about terms here shall we? It's a "hung parliament" until a Throne Speech passes, no one can "win a minority" in Westminster system it has to be negotiated among the MPs themselves. I favour ruthless prosecution for election fraud and rigging for any commentator that tries to say that anyone has "won a minority" on election night. It should literally be illegal to say that nonsense phrase on that night. I think you need to review your terminology. If the sitting PM wins a plurality of seats, he has a right and will be tasked with presenting a Throne Speech to the House, the Government he leads at least until defeated on a confidnece motion is a minority government. 4th Paragraph from the bottom: "NDP would be up seven seats to 70%". Need to remove the "%"
Thanks for catching the typo, guys. The steady Liberal decline continues, only now the support seems to be moving left rather than right. Wonder which ridings the polling companies will pick as the 'ones to watch' - I know mine is a 3 way Green-Liberal-NDP race with the Conservatives an afterthought despite coming in 2nd last time (they haven't picked a candidate yet and provincially had to fly one in from Southern Ontario resulting in a sub 10% showing). I'd figure any that Eric has listed around the 50% mark for odds of winning are the key ones. Seems things have been steady in the recent while. I could see the Conservatives gain during the summer month with a feel good budget and some election year goodies for the electorate. Stephen Harper is the front runner in this election. He is politically shrewd. His party has deep pockets and is well organized. The base is right beside him and just as committed to him as they were back in 2004 or 2006. The way used the Indian PM's visit to his advantage was impressive. Even as a partisan Liberal, I am a little weary of Trudeau. His "new style" politics does not make sense. I am confused about his stance on a coalition. The Liberals need to realize they need the NDP in some way or form to govern. Chances of a Liberal majority are slim. Do the Liberals really expect a large NDP caucus of 60-80 MPs prop up a Liberal government of 110-130 seats with minor concessions? The federal Dipper culture changed, the front bench NDPers are more pragmatic than idealist. These guys like Mulcair, Cullen, Angus, Dewar etc want power. And what if the Conservatives get more seats than the Liberals? Which center-left party is going to prop up the ruthless right-wing party? What will they say to their progressive base after that? Is Trudeau going to say with a straight face that he chose to prop up Harper because Mulcair is old fashioned and the LPC/NDP have policy differences on minor schematics that most people don't care about? First, the numbers. Whether a few potential voters leave the Liberals for the Conservatives, or for the NDP, the result is roughly the same, because a split on the left benefits the CPC almost as much as a direct vote. If any of the parties hope to win a sizeable minority, let alone a majority, they are going to have to start moving the numbers in a more significant way. Second, I'm not sure what Trudeau has to do in the next couple of months, but he has to be aware of the fact that those awful CPC ads which backfired also worked, at least to a degree. Trudeau is not unskilled, unintelligent or inexperienced in either political life or real life. He is barely three years younger than Harper was when elected PM. He held more "real jobs" than Harper ever did, spent less time as a policy wonk, volunteered many hours to Katimavik and charitable causes, and actually showed considerable political skill winning a tough riding with a popular MP, and then increasing his margin of victory against the tide. And yet... and yet even Liberal supporters feel like they need to qualify their support. Okay, Trudeau has left himself open to some skepticism based on a few things he's said. But I find it interesting that criticism of him seems to be far more knee-jerk and heavier than seems deserved. I suspect that those ads have had much of the impact they were intended to, and while the public and media loudly lament the ham-handedness and "inaccuracy", they are nevertheless subconsciously subscribing to that view. I honestly don't know. I am willing to give at least the benefit of the doubt, even on something I disagree with, like C-51 or FIPA. But perhaps there's a thin line between the benefit of the doubt, or skepticism, and partisanship. Sorry, Justin Trudeau is just not careful enough in what he says for politics. And he makes top-down decisions like backing C-51, or Keystone XL, that are by definition vast shifts in who can support his party. He has aligned the Liberals with the Conservatives far more than any previous leader. I could see the Conservatives gain during the summer month with a feel good budget and some election year goodies for the electorate. " If you mean stable in that the Liberals are dropping 1 pp / month for the last 6 months? My daughter did not realize that she was going to get cheque for just under $1,000 in July for the new family allownace. Stable as in the Liberals and Tories are usually neck-to-neck in the last few months after the Ottawa attack. Before that polls were stable in the sense the Liberals were leading the Tories by a few points and seemed like they would be elected to a comfortable minority government where they will have more seats than the Tories. And if we go way back to 2012, polls were stable in that the Tories and NDP were usually neck-to-neck for a long stretch. It is common for governments to bring forward pre-election goodies during election year. It can come as tax cuts, increased government services, credits or whatnot. It brings forward a positive vibe toward the government. I predict the rolling average before the writ is dropped to be something like CPC 35% LPC 29% NDP 24% GPC 6%. According to the latest EKOS poll with its n=3,309 will heavily weight the 308 average has the Liberals at 28.5 on April 15. To stay at 29 until the campaign the liberals have to stop losing a point a month. They are basically in free fall as far as the unscientific polls. The goodie of $1000 cheque from the Government of Canada to all families with a couple of kids seems to be a huge motivator to vote for the current guys, It is already in place accruing for the big lump sum payment to kick of the campaign. Tom Petty Free Fallin' awesome song ... maybe Trudeau could use it in a campaign to raise money. No question Harper is the strongest most proven campaigner. IF the Libs & NDP were serious about beating him they'd decide not to run against each other in Conservative held seats as a way to make strategic voting work (that is about the only way it can - if you remove all but one option on the ballot so people don't get confused). Elizabeth May tried to get them to talk and set up a one election agreement that would do something like that and then post-election set up a new voting system which would make it impossible to get a majority with less than 1/2 of voters picking your party. But of course the NDP & LIberals dream of having 100% of the power so they said 'screw it'. Post-election they'll probably work together but with fear of the '08 mess. No way the Bloc is mixed in again ever and the Greens will push hard to be part of it but if it ends up as a NDP & LIberal= majority then neither will pay attention to anyone else and they'll do an agreement as both want power and I can't see them both saying 'OK Harper you get to keep running the country as we're too greedy to talk to each other'. The biggest problem the NDP and LPC have with pre-election co-operation is that both parties want to be the senior partner in a coalition agreement. The Liberals do not want to play second fiddle to a Mulcair-led NDP government. The NDP do not want to play second fiddle to Justin Trudeau. Dippers are frustrated that Trudeau easily stole the NDP thunder. If it wasn't for Trudeau, polls will show Mulcair and Harper neck-to-neck and the LPC 10 points behind. Now Trudeau made things more confusing by refusing a coalition with Mulcair. Perhaps the notion is that a Trudeau-Mulcair coalition will see Mulcair dominate and be the de facto PM even if he is just deputy. Electoral reform won't happen in this country either. There are too many factions of which system should be implemented. The apathetic electorate does not really care. The LPC want ranked ballots which would benefit them as they more likely to be the second choice of other parties due to their centrist nature. The NDP want MMP as pre-2011 it would have benefited them. Right now the NDP benefits from FPTP, at least in Quebec where they would win a majority of the seats with just 30% of the vote. "Electoral reform won't happen in this country either. There are too many factions of which system should be implemented. " I agree completely. Only mass vote-swapping of 100,000 voters/election or more could force it to happen, since such a tiny faction could not be allowed to keep swinging all elections forever. So if you want reform, you have to vote swap and be very loud about it. Layton made Harper Prime Minister as the NDP took away enough GTA votes to tilt a bunch of 3-way races to the CPC. 3200 votes for the weaker opposition party in 13 ridings gave Harper his majority. An NDP resurgence in the GTA will make for a repeat. The CPC attack ads are targeting Trudeau instead of Trudeau as that's where they need to move the meter. There's still a way to go to get 39.6%, but the CPC looks like they understand their problem and look on track to get it. Hog wash, plain and simple. The Tories won because people voted for them, the end. If the liberals were so deserving of elections they would have been able to convince people to vote for them. And quite honestly there are between 40% and 60% of people who didn't vote, so there's a huge pool of voters that could have tilted the balance had the liberal be interested in going after voters. I agree I don't think one can blame a party for the outcome of an election. people should vote for who they think is the best candidate, strategic voting doesn't work and more likely than not you will end up with a M.P./ M.L.A. you don't like. Is right some 39% of Canadians did not vote in 2011-more than enougfh to elect a NDP, Liberal or CPC majority. The reason the Liberals lost is not because the NDP "took their votes" but, because the party was foolish and elected Ignatiev as leader a man who Canadians rightly decided did not have enough experience being a Canadian to place in the high office of prime minister. I'm a Liberal partisan, but the notion that the Layton made Harper PM is ridiculous. It's that kind of attitude that turned off people from the Liberals in 2011. Ignatieff's remark during the debate that only the Liberals can win power and the NDP will never win power contributed to the NDP surge in the RoC. The federal Liberals felt they were entitled to votes in the GTA and other parts of the country. The Cons won in 2011 thanks to an assortment of factors - the Libs having a horrid leader for the 2nd election in a row, the NDP eating a lot of Liberal votes but not enough to win ridings outside of Quebec, the assorted 'dirty tricks' the Cons did both legit (great focus on swing ridings, solid database to track voters) and illegitimate (millions of taxpayer dollars spent on ads pre-writ which they are doing again, the robocalls issue). This election will be interesting as the Cons are taking a page from the Libs namely buying votes with taxpayers own money via the money to families this summer - totally disgusting and past Reform/CA/PC leaders would've been screaming about it being disgusting had the Libs done it. An interesting factor on the west coast will be the Green push for seats - can the Greens do the same focus that got Elizabeth May elected in 2011 to get a handful or even 12 seats this time? (a big lesson learned in 2008 and 2011 - winning seats is all that matters so focus 100% on that) 12 being the magic number to be an official party in the HOC. Green focus is pretty much the main question in this election. Green voters are far more likely - like ten times more likely - to sign up for vote swapping to get their leaders and star candidates in. They do that on an organized scale nation-wide and ten to twelve seats are certainly within reach. Just a matter of tactics and whether May has the power within her party to tell disadvantaged candidates to take this one for the team. With formal swaps it's always possible to identify who lost a deposit, etc., and compensate those whose votes were swapped out. I dunno, to me it looks like the graph is showing the Green Party rather than the NDP is "taking advantage of the softening Liberal numbers"! Yes, not like the many liberal and conservative posters who simply offer divine reflection on the polls. The new EKOS numbers (released today) are interesting when viewed in the context of other EKOS numbers. Ekos' poll is a good read. what I found particularly interesting was that by social class the "poor" tend to vote Liberal or Conservative instead of NDP. Another indication that the NDP is run by a bunch of champagne socialists? No, though it may be an indication that people have been repeatedly TOLD that the NDP is run by a bunch of champagne socialists, which is something else altogether. 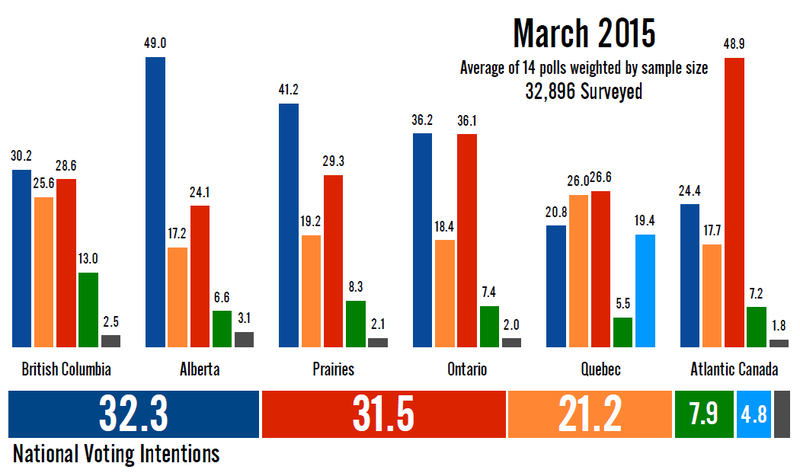 Compared to February, the CPC is up 5, the LPC is down 6, the NDP is down 3, the BQ is up 4 and the GPC is stable. In the Atlantic provinces, the CPC took a seat from the LPC. In Québec, the NDP is down 4 and the LPC is down 3, while the CPC is up 3 and the BQ 4. There is no change in Ontario and the Prairies. In Alberta, the NDP is up 1 from the CPC. In BC and the Territories, the CPC made a gain on the LPC. The Liberals had such a terrible result in 2011 because many of their supporters stayed home instead of voting. With a more charismatic leader, I don't think this phenomenon will occur in 2015. People don't vote Liberal any more because the party doesn't stand for anything! The Liberals that stayed home last time will likely come out to vote CPC. The Liberals have moved to the Left. They still have the social responsibility but have given up on the fiscally responsible part. The Paul Martins and Frank McKennas and John Manleys are gone and replaced with Chrystia Freeland and Scottie Brisson. No room for Martha Hall Findlay in today's liberal party. The small block of Liberals that have supported MHF will have real trouble voting for the Red Liberals that have taken over their party. The CPC has claimed the middle ground. This is just insane. Scott Brisson as a far leftist? Really? Former PC leader, most fiscally prudent and carefully analytic of Paul Martin's financial cabinet? "BC Voice of Reason" is a pointless Conservative shill. Whatever "middle ground" means, it doesn't mean what BCVoR says it does. I think it's prudent to include a "focus factor" in these calculations. Some parties are far more capable than others of focusing resources on seats they can win. I think the Greens are most capable of it, by far, with most Greens being quite willing to vote-swap to get a star candidate in elsewhere. The Conservatives are ruthlessly tactical and so I'd probably rank them second in that regard, being quite willing to loot funds - even illegally - from a losing campaign to launder into a potential winner (as they did in the infamous "In and Out scandal"). The Bloc may also have learned to play tactically in this regard, but I can't say I've seen evidence of it. Also when do we have to factor in likely debate performance? On that grounds we could be -5 Trudeau, +3 May, at least, though May's vote will be split in as much as half inevitably on election day by the highly tactical voting Greens always do. Scott Brison was never PC leader. The second clause of your second sentence of your first paragraph doesn't make sense. Paul Martin did not have a financial cabinet, he had a cabinet of which Mr. Brison was not a member. You think the greens are most capable of allocating financial resources to winnable seats? they've won exactly 1 seat throughout their 22 year history, 3 seats if one includes provincial totals. I think the facts do not align with your conclusion that the Greens are the most capable "by far" of allocating resources to winnable ridings. BC Voice of Reason, I have no idea of who you are but I have been a member of the BC Liberal Party since 1968, worked on the separation of the two wings of the Party in 1989/90 and have worked on or been President of the Oak Bay Gordon Head BCLP and the SGI LPC Ridngs for a number of years. You simply have no idea of what you are talking about. Yes, LPC Liberals stayed home in 2011. They will not stay home in 2015. They will not vote for the CPC which at best is a corruption of the former Progressive Conservative Party of C. I was a delegate who supported MHF. I do not know what you base your information on. I hold a number of volunteer awards from both Party's for my service. Please identify yourself. My email is paulmckivett@shaw.ca since you do not go by your real name on this blog. Cheers, Paul McKivett, President, SGI LPCBC, Past President, OBGH BCLP. Why do need to know who I am ? We are communicating at a level that I am comfortable with. It seems that you are worried about LPC card holders voting CPC? Sorry to burst your bubble but the 7,000 of you LPC delegates that supported MHF get exactly 1 vote each in the next election. There would have to be more than a little disappointment in your fellow Liberals that a serious person like MHH was over-looked.. twice by the Liberal party faithful and has moved on. Adding to that MHF getting replaced with an openly strong socialist in the Liberal Party hierarchy... Chrystia Freeland . However I fully expect all card holding Liberals and those who give political donations to the Liberal party to vote Liberal this election. My point is that people (ex-Liberal voters not necessarily Party members) who could vote for a party that had Paul Martin , Frank Mckenna, David Emerson and John Manley will obviously have difficulty supporting the current Liberal Party. If they stayed home last time, this time it will be easier to vote CPC to prevent the damage that could be done by Trudeau/Wynne/Freeland. On a side note as a MHF supporter you probably consider yourself strong environmentalist. How in the world can you live in place that dumps its raw sewage in the Ocean? Latest Nanos polls shows Harper fighting for third place in party power index. Libs with 5 point lead and Trudeau as best PM. Libs lead and Harper third as best PM, with huge negative scores -25. I disagree. BCVR knows exactly what he is doing. He's trying to shoehorn everything in favour of the CPC. And it's blatantly obvious Jimmy to anybody who looks. hey jimmy and Peter ... I don't get upset when you try to shoe-horn everything in to show Harper and the CPC in the least favorable light. You have a much harder job to do. Are you upset with my consistent challenging of all the IVR polls on the un-scientific claims they make on the the margin of error and probabilities and the fact that they can be proven to not be getting a true random sample? Hey jimmy notice the PMO "spin" in that reply ?? I have been waiting for mention of your latest CBC piece on 308. You seem to be following my meme of comparing what the pollsters have published in the last elections, when they said it and how it ended up. It was your best work to date. What is going on in Alberta?